The Italian flag, la bandiera italiana [bahn -DYEH -rah ee -tah -LYAH -nah], is also known as the Tricolore [tree -koh -LOH -reh], i.e. tricolour (green, white and red). I dare say we Italians are not that affectionate towards our flag. You hardly see flags on the windowsills or porches. In my area you see more often Veneto flags. Sadly, I can only confirm the rumour that many Italians feel Italian only when there’s soccer involved. We normally feel a deepest bond towards our region and our town, I think. I alwas say: “I feel Veneta rather than Italian, and Padovana rather than Veneta”. That has nothing to do with politics for me, it is just a sentimental bond, a sense of belonging. Anyway, during the World Cup there are discussions and debates concerning the right timing to display the Italian flag. Someone displays it immediately, someone waits after the quarter-finals “per scaramanzia” [pehr skah-rah-mahn-TSEE-ah], to avoid bad luck. My friend Martino can not help but hang the so-called “bandierone“ [bahn -dyeh -ROH -neh], big flag, during each match of the Italian national soccer team, while we watch it on TV. During the game, if things go well, no problem. The Bologna students. In 1784 two students of Bologna attempted an uprising against the pontifical rule in their city. They chose as a symbol of their rebellion the cockade of the French Revolution, substituting green for blue (as a symbol of hope) . However, some scholars think that this can not be acknowledged as the first use of the Italian colours. They think that the intentions of the two students were only related to their area and the colours were chosen cause they were also the colours of Bologna, plus the green. Furthermore, according to someone, the colour green was added only by mistake. The French “lesson”. Another theory says that until the arrival of the French in Milan (1796) there are no proofs of the existence of the Tricolore. In October 1796 Napoleon informed the Executive Board of the birth of the Lombard Legion. They had to choose a representative flag, in order to be recognized in the battlefield. Therefore, the flag was chosen chosen on the model of the French flag. On the document it is reported that the national colours adopted are green, white and red (probably derived from the Milan’s city militia). For the Italians it had still no “national” significance. On January 7, 1797, Giuseppe Compagnoni, considered the “Father of the Tricolore”, proposed, while in Reggio Emilia, to make that flag universal. 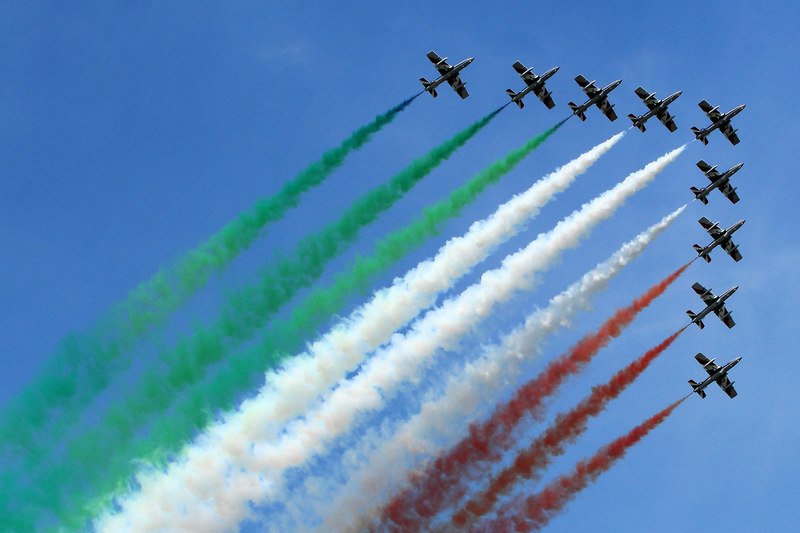 That’s why the Italian flag is celebrated each year on January 7th with the Festa del Tricolore in the city of Reggio Emilia. February 12, 1797 the flag was waved and showed to the public for the first time in Modena. At that time the colours were disposed horizontally. Only in May 1798 it was finally specified that “the flag consists of three bands parallel to the pole: green, white and red“. It wasn’t yet the “Italian flag” as we know it though, just the flag of the Cisalpina Republic (an area covering approximately Lombardy and Emilia Romagna). After the defeat of Napoleon in 1814, the Tricolore was abolished. However, it remained in the memory of the people. Therefore it was raised several times in different occasions, especially during the 1848 revolution against the Austrian rule. The Kingdom of Italy is proclaimed only in 1861. The tricolore flag is adopted but it presents in addition the emblem of the Savoy Royal house (a red shield with a white cross, rimmed with blue). The Italian Republic was born only after the II World War (June 2nd, 1946). It was then that the final form of the Italian flag was stated: three vertical bands of equal size with the colours green, white and red.